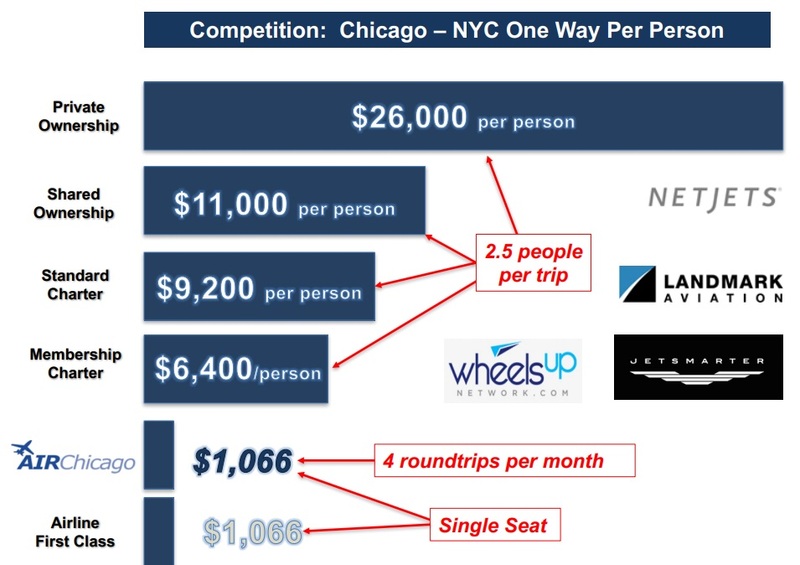 Four (4) complimentary Shared Corporate Shuttle Flight Segments per year for life for each $1,000 invested in AirChicago Holdings, Inc. Significant discounts on MyJet Express Program Seat Hours. Access to AirChicago-arranged MyJet Express, Go-Jet, Co-Op, Explorer and JetAway flights for Cardmember and guests. Complimentary membership in the AirChicago Barnstormers Club. If you are considering an investment in AirChicago Holdings, Inc., you’ll want to meet the AirChicago Leadership Team and get all your questions answered. Join us for an exclusive AirChicago Partner Briefing at Chicago Executive Airport and find out what affordable private-jet travel and this exciting investment opportunity are all about. And, because we want to meet you too, if you attend an AirChicago Partner Briefing before February 23, 2019 and invest in AirChicago Holdings, Inc. within 3 days after attending the briefing, you will be awarded the option of purchasing 10 MyJet Express Program Seat Hours at a 95% discount ($50 each). Don’t miss out! Register for an AirChicago Partner Briefing now. 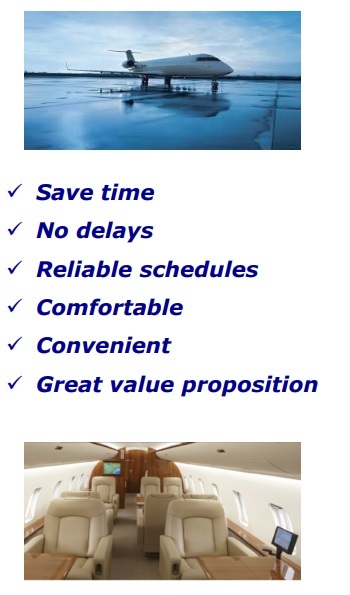 AirChicago is an affordable luxury alternative to the frustrating and inconvenient commercial airlines. AirChicago-arranged private-jet flights fly to-and-from business aviation airports all over the United States. Nonstop flights depart in the morning and return in the evening on time. You have a limited time to invest in AirChicago Holdings, Inc. (ACHI). When you invest in ACHI You'll receive equity ownership in the company and an AirChicago Founder+ Jet Card. The AirChicago system of private-jet travel is designed to solve the major problems currently faced by airline travelers—contemporary airline travel is inconvenient, time-consuming, exasperating, demeaning and often overly expensive relative to the value received. AirChicago has solved this problem by designing an air-travel system that provides executive private-jet travel at or near airline fares. 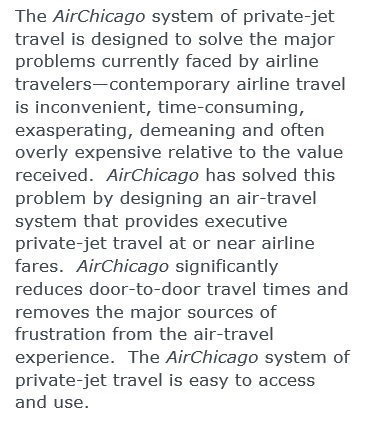 AirChicago significantly reduces door-to-door travel times and removes the major sources of frustration from the air-travel experience. The AirChicago system of private-jet travel is easy to access and use. 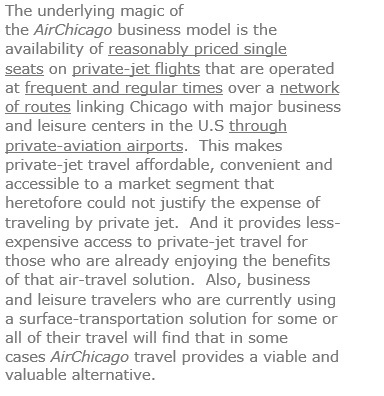 The underlying magic of the AirChicago business model is the availability of reasonably priced single seats on private-jet flights that are operated at frequent and regular times over a network of routes linking Chicago with major business and leisure centers in the U.S through private-aviation airports. This makes private-jet travel affordable, convenient and accessible to a market segment that heretofore could not justify the expense of traveling by private jet. And it provides less-expensive access to private-jet travel for those who are already enjoying the benefits of that air-travel solution. 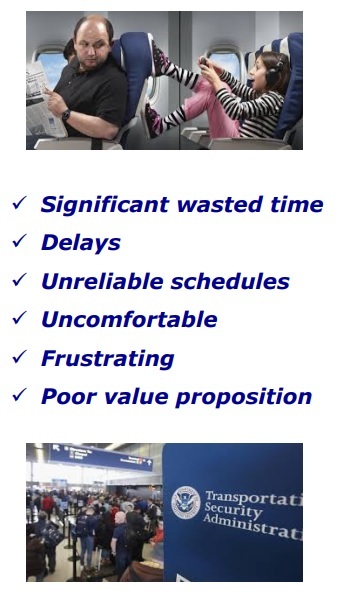 Also, business and leisure travelers who are currently using a surface-transportation solution for some or all of their travel will find that in some cases AirChicago travel provides a viable and valuable alternative. A traveler on a typical AirChicago-system flight will save 5 – 6+ hours over airline flights on a round trip. By utilizing an AirChicago-arranged flight, a traveler can turn a 2-day-airline trip into an easy 1-day-AirChicago-arranged trip. For a business traveler who makes an average of 4 business trips per month, turning 2-day trips into 1-day trips means increasing productivity by 48 days a year. AirChicago plans to initially offer non-stop service to 30 popular business and leisure destinations in the U.S. from Chicago Executive Airport. Access to AirChicago flights is restricted to AirChicago Jet Cardmembers and their guests. Secured $420,000 in operating capital through an Illinois State Regulation Crowdfunding offering ($150,000) and an SEC Regulation D private-placement offering ($270,000). Recruited and trained its Leadership and Marketing Teams. Incorporated 2 wholly owned subsidiaries—AirChicago Jet Card, Inc. and MyJet Express, Inc. Received MyJet Express Public Charter Operator authorization from the USDOT. Conducted the inaugural AirChicago-arranged Go-Jet flight. Conducted the first Cardmember-initiated AirChicago-arranged Go-Jet flight (revenue generated). Scheduled the inaugural MyJet Express public-charter flight for November 5, 2018. Launched, developed and validated the AirChicago Jet Card marketing plan by selling or receiving deposits on over 110 AirChicago Jet Cards (revenue generated). Established the AirChicago Board of Advisors (BOA). Initial members of the BOA include General John Borling (USAF-ret. ), Dr. Charig Patel, Mr. Albert Montano and Ms. Lyndsey Zhang. Recruited Coach Mike Ditka as an AirChicago Spokesman. Secure $1,000,000 in additional operating capital through 2 Illinois Regulation Crowdfunding offerings ($500,000 total) and a continuation of its SEC Regulation D private-placement offering ($500,000). Launch a multi-channel, integrated AirChicago Jet Card marketing campaign featuring Coach Mike Ditka that is focused on the market within 20-miles of Chicago Executive Airport. Launch regular Chicago – New York MyJet Express Network flights beginning November 5, 2018. Establish increasing revenue and market-traction trends with the sale of AirChicago Jet Cards and MyJet Express flight-segment fees. Secure $10,000,000 in additional operating capital through an SEC Regulation A+ and/or Regulation D offering. Expand the AirChicago Jet Card marketing campaign to include the Chicago Metropolitan Area. Secure leases on 35 Gulfstream G-IV business jets. Expand MyJet Express Network flights to a total of 30 cities from 4 business-aviation airports in the Greater Chicago Area. Achieve breakeven+ cashflow on an operating basis. The benefit of selling into an aware market. A large percentage of AirChicago’s potential customers are familiar with jet cards. The AirChicago Jet Card is one of the few jet-card programs that provide access to a Public Charter flights on a per-seat basis. Typical jet-card programs provide access to whole-aircraft charters operated by FAA Part 135 on-demand air carriers. The AirChicago Jet Card is by far the lowest-cost jet card in the market. AirChicago Jet Card upfront costs, recurring costs and hourly rates are a fraction of those charged by typical jet-card programs. The AirChicago Jet Card is the only jet card that can be used to purchase a single seat on private-jet charter flights. The AirChicago Jet Card has the lowest required jet-card-commitment level. The AirChicago Jet Card allows the most number of flight hours (AirChicago is unlimited vs. 25 – 100 hours for typical jet cards). 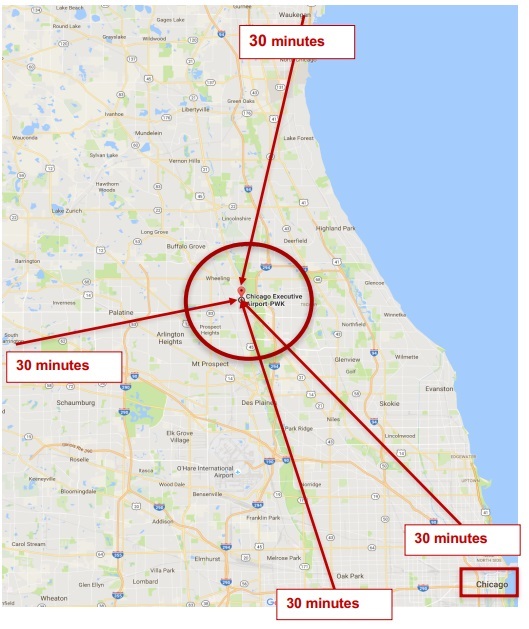 Database searches performed by Bay MarketForce indicate that within a 20-mile radius of Chicago Executive Airport, there are approximately 2,000 company-headquarters facilities serving companies with annual revenues in excess of $10-million. Also, within that area, there are approximately 45,000 individuals whose net worth exceeds $1-million, their annual income is at least $250,000 and they belong to an airline frequent-flyer program. An estimated two-thirds (99,000) of the estimated 150,000 Chicago-area business travelers who may be interested in and can afford an AirChicago Jet Card live within a 1-hour drive time of Chicago Executive Airport. The AirChicago Jet Card marketing-and-sales campaign is multifaceted, highly targeted and innovative. It is a high-tech/high-touch, highly integrated marketing-and-sales campaign. The campaign includes the following elements: a traditional direct-mail campaign that is designed to generate inquiries; a highly-targeted, high-response-rate follow-up direct-email campaign; an email campaign; print-and-online advertising campaigns; a publicity campaign; a promotion campaign; a Website with SEO; an outbound-and-inbound-phone campaign; a direct-contact campaign; a referral campaign; a social-media campaign and special introductory offers. AirChicago has retained the services of Mr. Mike Ditka as a spokesperson for the company. Surf Air, headquartered in Santa Monica, CA, is a membership-based, private-aircraft operator. It was founded in 2013. It recently announced that it has signed up its 3,500th member. OneJet began service between Indianapolis and Milwaukee on April 6, 2015. Rise, based in Dallas, TX, started operations in June 2014. Texas Air Shuttle is based in Conroe, TX. On January 6, 2016 it received its FAA Part 135 on-demand air carrier certificate. Jetsmarter, headquartered in Ft. Lauderdale, FL uses a hybrid empty-leg-charter-broker-public-charter business model. It claims to be the fastest-growing single-seat-charter operator in the world. Its annual access fees range from $10,000 to $15,000. Jetsmarter offers 3 types of services: Jetdeals—seats on empty-leg charter flights, Jetcharter—a charter-broker service and Jetshuttle—single seats on fixed routes. Jetshuttle routes include a Chicago (Midway) to New York City route. However, it appears this route is flown infrequently. Its business model is partially based on using a USDOT Public Charter Number. Jetsmarter claims to have over 9,000 members. Wheels Up, based in New York City was founded in 2013 by Kenny Dichter. In 2001, Dichter founded Marquis Jet which went on to become one of the largest jet-card companies. In 2010, after more than $4 Billion of jet card sales, Marquis Jet was sold to NetJets, a Berkshire-Hathaway company. Wheels Up began operations as an aircraft-charter membership club selling membership for an initial upfront fee of from $17,500 to $29,500. Monthly membership fees range from $8,500 to $14,500. Members can purchase whole-aircraft charters in twin-engine turboprops (King Airs) and light-to-medium business jets. As of May 2016, Wheels Up had over 2,750 individuals and companies as members. It recently announced its entry into to single-seat-charter market by offering scheduled flights in King Airs and Cessna Citations in selected markets on the east coast and on a transcontinental route. Dichter has predicted that Wheels Up membership will pass the 3,700 mark. Capt. David C. Koch: Capt. Koch is the Chief Executive Officer and Chairman of the Board of AirChicago Holdings, Inc. He has over 50-years of aviation-industry experience. Stephen G. Wasko: Mr. Wasko is the AirChicago Holdings, Inc. President and Chief Operating Officer. He has served as the president, COO and CFO of several start-up firms. He is also an experienced aerospace engineer. Nathan Juncan: Mr. Juncan is the AirChicago Jet Card, Inc. President. He is a successful Chicago-based entrepreneur and aviation enthusiast. Christopher Jansing: Mr. Jansing is the AirChicago Jet Card, Inc. Executive Vice President-Cardmember Services. He is a successful entrepreneur with extensive private-jet-travel experience. Christine Koch: Mrs. Koch is the MyJet Express, Inc. Vice President-Public Charter Operations. She is an experienced professional pilot with prior experience with USDOT Public Charter operations. Bay MarketForce: Bay MarketForce has, since its founding in 2007, generated $1.5-billion in total pipeline for its clients. 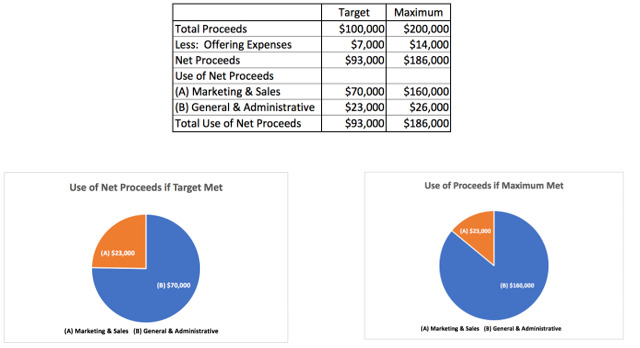 Its current active pipeline is $534-million with total sales due to Bay MarketForce leads equaling $137-million. Its clients include Travelocity, IBM, Johnson Controls, Seko, Benz Oil, ABC, Domino’s Pizza, Northwest Pipe and Skyline Technologies. The viewing of this offering is limited to residents of Illinois by state law. By clicking the button below, I confirm that my primary residence is within the State of Illinois.